The picture is taken from the “Berne Chronicle” by Bendicht Tschachtlan, which dates from 1470. It shows the city as it was in the late 15th century. 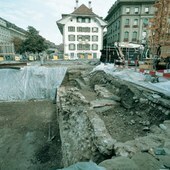 Remains of the city wall uncovered by excavations in the Amthausgasse, in front of the Café Fédéral. 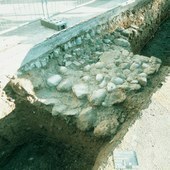 Wall of the town moat, built in 1255, with the moat on the left and walls of cellars built since on the right. Parliament Square, with weekly market. Photo taken between 1901 and 1908. 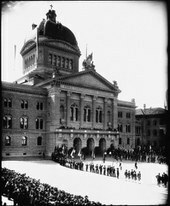 The first major parade took place in Federal Square on April 1st 1902, to mark the occasion of the United Federal Assembly and members of all upper houses moving into the new parliament building. Federal Square after 1909, with the new National Bank, the Credit Institute and the Savings and Loan Bank.